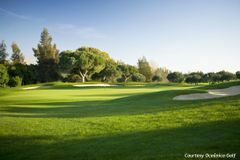 Although the Victoria and Old courses are touted as the must play courses in Vilamoura, the other Dom Pedro layouts still rank among the best in the Algarve, with the Millennium being a fan-favourite. Since 2000 the course has matured wonderfully, seamlessly integrating with the rolling hills that the region is known for. Found in the thriving resort town of Vilamoura, in the heart of the Algarve, the Millennium Course is ideally located for golfers, with the marina, beach, bar and hotels all just a few minutes away. Designed by the legendary Martin Hawtree, the course cuts through acres of pine forest but is open enough to be enjoyed by golfers of any ability. We found 28 offers matching your search. The Millennium is a fantastic course in its own right, measuring 6,718 yards, which cuts through the monumental pine forests that dominate the landscape. Martin Hawtree was responsible for creating the layout, using 9 holes of the old Laguna course, and he has been successful in producing a beautiful course that strikes the perfect balance of testing the better golfers whilst remaining manageable for the average visitor. The short 6th is the highlight of the Millennium, where the target will shrink before your eyes as you stare over the imposing water that guards the front of the green. This hole typifies how enjoyable the Millennium is, making it a sure fire hit for your golf holiday in Vilamoura. the round took us about four hours, no delays. speed of play was good, not held up by group in front. Most enjoyable of the three courses played, though again we all found the greens too difficult. the starter was the most rude and aggressive person, got the tee times all wrong, when challenged told me I should go play somewhere else, he couldn't care less. after the management corrected him, he still wouldn't apologise, ruined the day. I've played this course at least 15 times and have never been treated so badly at any club. Paths need tidied. Possibly overplayed. Bit tired. Hard for a group of lads mostly playing off 28 but it was a great challenge and the course was beautiful in the sun. Second time I’ve played it. Fantastic course and in excellent condition. Although possibly easier than the orher two courses rated, a good test of your golfing ability nevertheless. Beautiful course. Extremely enjoyable day. despite playing a four ball round this course in under 4 hours we were constantly told to hurry up. They appeared to let everyone go at the same time. I think more should be done to space out the play a bit more. Easier and less picturesque than other courses. Course is very playable for all level of golfers. Nice course quite open not so many trees to catch you out. Enjoyed playing here but the greens and tees were in poor condition on the other hand the fairways and bunkers were excellent . The driest fairways we played all week. Beautiful course and all Ladies found it good to play. An interesting course which keeps ur mind on ur game. A great course with some lomg walks between greens and tees. Best to take a buggy.